NOTE: This process will erase your external device and wipe all data on it. Disconnect all external devices except for monitor, keyboard, mouse and required storage volumes. Connect your external device e.g. hard disk. NOTE: For safety the volume/partition you are going to use must be at least 10GB in size. However, the volume/partition you are going to use cannot be used for anything else so there is no need for it to be too large. With large hard disks we highly recommend partitioning them before using them as an external installation device. There is nothing stopping you creating multiple partitions and putting different versions of the Mac OS X installer on each partition. Insert your original "retail" Mac OS X installation DVD disc or the install disc for your particular computer. Copy the volume name of your original "retail" Mac OS X installation DVD disc exactly (usually "Mac OS X Install DVD") to the external device volume you are going to use. Go to Macintosh HD > Applications > Utilities > Disk Utility. On the left select your original "retail" Mac OS X installation DVD disc titled "Mac OS X Install DVD". NOTE: with macOS 10.13 or later Disk Utility only shows volumes by default and the Sidebar can be hidden - go to View menu > Show Sidebar and View menu > Show All Devices to see everything. On the right click the "Restore" tab. Drag the "Mac OS X Install DVD" icon of your install disc from the left to "Source". Drag the "Mac OS X Install DVD" icon of your external device from the left to "Destination". As you've erased/formatted your external device in the steps above you do not need "Erase Destination" ticked but it does no harm to leave it. For safety don't do anything else on your computer until the process has finished. When the process has finished Quit Disk Utility. Eject the Mac OS X installation DVD disc. Unmount and disconnect your external device. Your External Installation Device is now ready for use. To boot from it shut down your target computer, connect your external device and startup your computer holding down Option to choose the external installation device from the Startup Manager. Install Mac OS X as required. Insert your Install DVD (or the official Lion thumb drive). Copy the volume name of the Install DVD (or the official Lion thumb drive) exactly (usually "Mac OS X Install ESD") to the external device volume you are going to use. 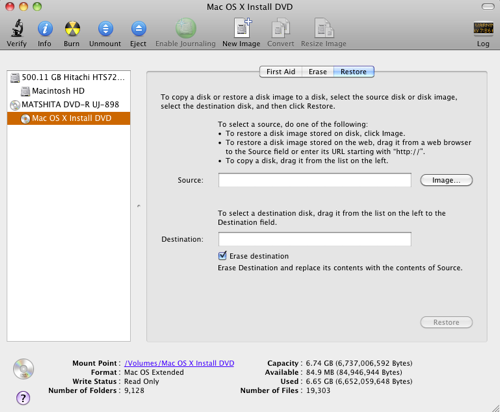 On the left select the Install DVD (or the official Lion thumb drive) titled "Mac OS X Install ESD". Drag the "Mac OS X Install ESD" icon of your install disc/USB thumb drive from the left to "Source". Drag the "Mac OS X Install ESD" icon of your external device from the left to "Destination". Copy the OS X install disc image (usually "InstallESD.dmg") to your local hard disk e.g. the Desktop. Double click the disc image (usually "InstallESD.dmg") to open it. Copy the volume name of the mounted disc image exactly (usually "Mac OS X Install ESD") to the external device volume you are going to use. 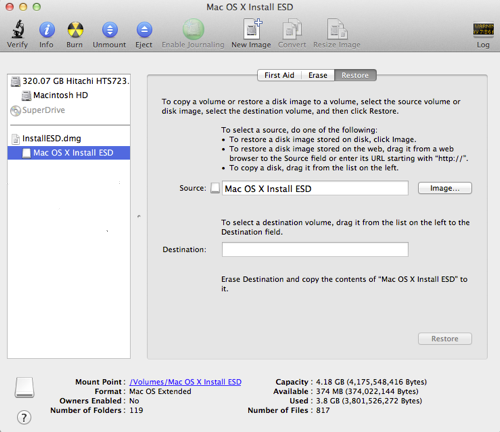 On the left select the mounted disc image titled "Mac OS X Install ESD". 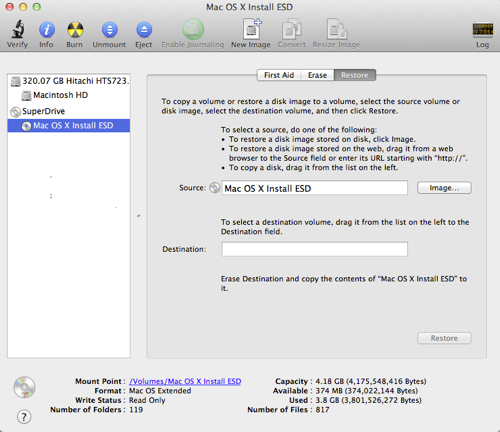 Drag the "Mac OS X Install ESD" icon of your mounted disc image from the left to "Source". Eject the "Mac OS X installation ESD" icon (of the Install DVD/thumb drive/mounted disc image). NOTE: You can only use a "USB" device with Apple's Recovery Disk Assistant e.g. thumb drive or hard disk. NOTE: An internet connection is required to use an Apple Recovery Disk. Download Apple's Recovery Disk Assistant and copy the application to your boot disk "Applications" folder. Connect your external USB device. When the Recovery Disk Assistant completes, the new partition will not be visible in the Finder or Disk Utility (see this Apple Tech Article). NOTE: If you get an uninformative error message make sure the USB device is partitioned with the "GUID Partition Scheme" - many hard disks and USB thumb drives are pre-formatted for Windows using the "Master Boot Record" partition scheme. NOTE: An internet connection is required to reinstall OS X 10.7 Lion or later in the recovery mode. See this article on using the Lion or later recovery mode. NOTE: For more information on Apple's Recovery Disk Assistant including computer models supported see this . Make sure you have the "Install OS X Mavericks" or "Install OS X Yosemite" application in your boot disk's "Applications" folder. If you don't go to Apple menu > App Store… and click on the "Purchases" icon at the top (log in to the store with your Apple ID if necessary). Locate 'OS X Mavericks' or 'OS X Yosemite' in the list and click "Download" to the right (this may take some time to download as it is ~5GB+).